I like this because the addition of the picture gives an instant visual clue that this is a retweet (there is no picture there, normally). Clicking on the user icon at the bottom would open up @rschu’s user information, not @dane’s, so you can look at his tweets directly, or start following him, if you wish. 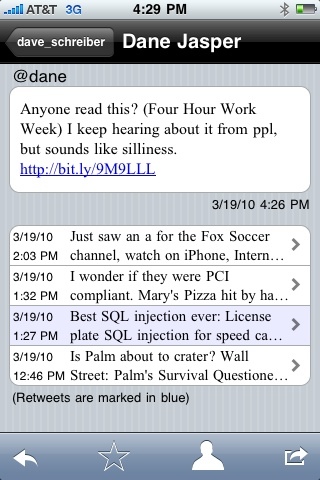 This will all be in ThrededTweet 1.3.0, which I uploaded to the App Store for approval tonight. Apple has really sped up approval times, so hopefully it will be available later this week. 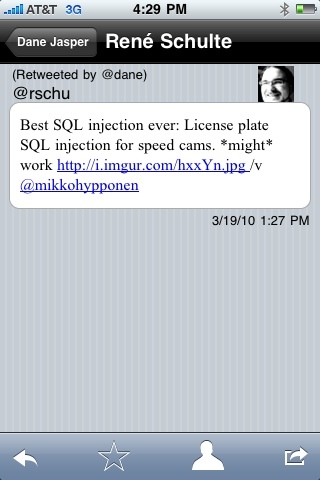 This entry was posted on March 24, 2010 at 3:46 am and is filed under iPhone, Programming, ThrededTweet, Twitter. You can follow any responses to this entry through the RSS 2.0 feed. You can leave a response, or trackback from your own site.